SPRINGERVILLE, Arizona, June 8, 2011 (ENS) – A wildfire that has been blazing in the Apache-Sitgraves National Forest in eastern Arizona since late May continued to advance on Wednesday, amid rolling power blackouts and reports of gasoline shortages. 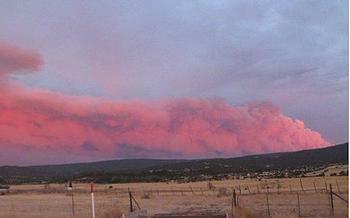 The Wallow Fire is now the second largest in Arizona history with about 389,000 acres (about 157,545 hectares) burned. 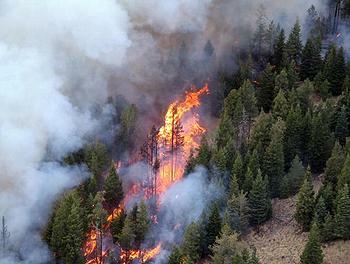 It is at zero percent containment and has become the top firefighting priority in the nation. “The fire moves so fast. It’s the same as holding a matchstick upside down,” said Jim Hyland, a spokesman for the firefighting operation, which has drawn crews from around the country. Crews got no help from the weather today. Some 1,940 firefighters, assisted by 14 helicopters, faced another day of high winds and low humidity, a day after the blaze forced the evacuation of a major part of the town of Eagar. This afternoon, the Apache County Sheriff’s Office issued full evacuation orders for the towns of Eagar and Springerville, effective immediately. More than 1,000 people were evacuated from Eagar by Tuesday night, after some 2,600 people were forced to leave their homes in the mountain communities of Greer, Alpine and Nutrioso. A pre-evacuation notice is in effect for Greens Peak, Hidden Meadows and the surrounding areas. The fire, which started May 29, is thought to have been started by a campfire that got out of control. To date, 11 structures have been burned, and another 588 are threatened. No injuries have been reported. To provide for public health and safety during management of the Wallow Wildfire, the Apache National Forest was closed to all public entry on June 3 and remains closed. The Sitgreaves National Forest is off-limits to fires of any kind, firearms and explosives. Petroleum-fueled stoves and lanterns are permitted. Due to extreme fire danger and concern for public safety, the Coronado National Forest will be closed to all public use beginning at noon on Thursday. The temporary closure applies to all ranger districts and includes visitor centers, campgrounds, picnic areas, trails, summer cabins and organization camps. The Wallow fire has sparked a political battle over forest management. Republican politicians in Arizona, including State Senator Sylvia Allen of Snowflake and State Representative Brenda Barton from Safford, have begun blaming environmentalists and federal forest policy for the blaze. But environmentalists say weather and drought conditions are the responsible parties. New Mexico and parts of Arizona are experiencing the worst drought conditions in recorded history and combined with windy, spring weather, extreme wildfires are predictable. No amount of thinning or other federal forest policy changes can prevent catastrophic fires in these conditions, said Bird.